Free Delivery on Orders Over £35 at Pets at Home Who doesn't love free delivery? Get all orders over £35 delivered at no extra cost! Free Click and Collect on Orders Over £35 at Pets at Home Make your shopping convenient, and enjoy free click and collect with your order at Pets at Home. New Arrival Kitten Products from £6 at Pets at Home WIth new arrivals products starting from just £6, there are savings to be made at Pets at Home. Up to 50% Off Spring Savers at Pets at Home - Food, Grooming and More! Stock up on essentials and goodies for your pet, and save up to 50% on your order at Pets at Home. Cat Furniture from £20 at Pets at Home Freshen up things for your little friend, and get them some new furniture at Pets at Home. Dog Healthcare from £2 at Pets at Home With healthcare products starting from just £2, Pets at Home is the perfect place to stock up on essentials. Cat Toys from £1 at Pets at Home With toys starting from just £1, this is the perfect way to treat your cat. Up to 35% Off Selected Aquatics at Pets at Home Make a saving with this great deal from Pets at Home. Cat Healthcare from £2 at Pets at Home Stock up on essentials at Pets at Home, and keep your kitty in great health. Dog Beds from £9 at Pets at Home Treat your dog to the best nights sleep ever, and pick up a dog bed for just £9 at Pets at Home. Flea and Tick Treatments from £2 at Pets at Home A healthy dog is a happy dog! Stock up on treatments for your pooch at Pets at Home. Pets at Home started out in 1991 with a single shop in Chester stocking scratching posts, fish tanks, pet food, kennels and more. With big ambition, though, Pets at Home went from strength to strength, and by the end of the 90s had a whopping 140 stores. Today, it’s the United Kingdom’s largest and most popular pet supplies retailer, with 370 stores across the nation, selling everything you need for your pet, as well as offering in-store grooming and vet services. Pets at Home take the responsible and ethical treatment of animals, very seriously, and all staff are trained extensively in animal care and animal welfare. Just like you, Pets at Home employees have a passion for animals, and they are always keen to help you make the best choice on your purchase. Whether you’ve got a cat, dog, bird, fish, reptile or rodent, you can save a pretty penny with their incredible value. If paying too much is one of your pet peeves, look no further than Pets at Home. How do I use my Pets at Home discount code? 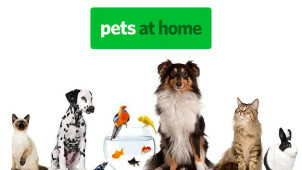 Sign up to Pets at Home’s VIP Club and instantly receive 10% off. How do I find more information about Pets at Home products? For detailed information on specific products, click the “description” heading. Do Pets at Home recommend I clean my new pet? Pets at Home suggest you should clean your pet at least once or twice a week. A regular clean not only provides good hygiene but also the ideal opportunity to spend time with them. How old do I need to be to buy a pet from Pets at Home? Because concern for the welfare of animals is the highest priority for Pets at Home, you must be at least 18 years old to purchase a pet. Can Pets at Home deliver my order at a specific time? As Pets at Home delivery is done through DPD, delivery in a specific time-slot is not available. Or click here to see the full range of contact options. All order over £35 get free standard delivery. You can return products either by post, courier collection or in-store. See here for more details. Pets at Home is the UK’s leading pet specialist, supplying everything you could need for your scaled, furry or feathered friend. Whether you’re after a new tank for your gecko, a new litter tray for your puppy or a bigger cage for your budgie, a Pets at Home discount code can help you save money on the things you need. With well over 350 stores across Britain, look no further than Pets at Home. More than just a shop, Pets at Home offers a huge number of in-store vet services to help keep your pet fighting fit. If your pup’s poorly or your kitty’s on the fritz, Pets at Home can help nurse them back to health. Pets at Home offers worming consultations and services, microchipping, advice on nutrition, as well as almost 400 veterinary surgeries around the country. Pets at Home loves your pet nearly as much as you do and certainly wants your beloved animal to enjoy the summer in great health! To make sure that your pet can enjoy the longer days just like us, you can browse an array of toys and outdoor accessories from Pets at Home. Whether it's a dog collar or perhaps a new cat flap to give them easy access to the garden, a Pets at Home voucher code will let you save on essential items for the summer! So let your pet know just how important they are to you and check out an array of items that'll put a spring in your pet's step!